Jesuit staff and players will emphasize the development of individual fundamentals (through shooting, passing, ball handling, footwork, man-to-man defensive skills) and basic play. Coach Rotz ’92 graduated from California State University, Sacramento with a B.S. in Kinesiology. He has been coaching basketball for 17 years at Jesuit and has an overall record as head coach of 55-22. Coach Rotz is currently the Assistant Director of Admissions. 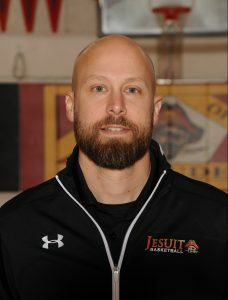 He played on 3 section title teams at Jesuit and believes players need to have toughness, selflessness, and joy to get the most from Jesuit basketball.